We apologize for the late notice, although we have kept our public calendar current. 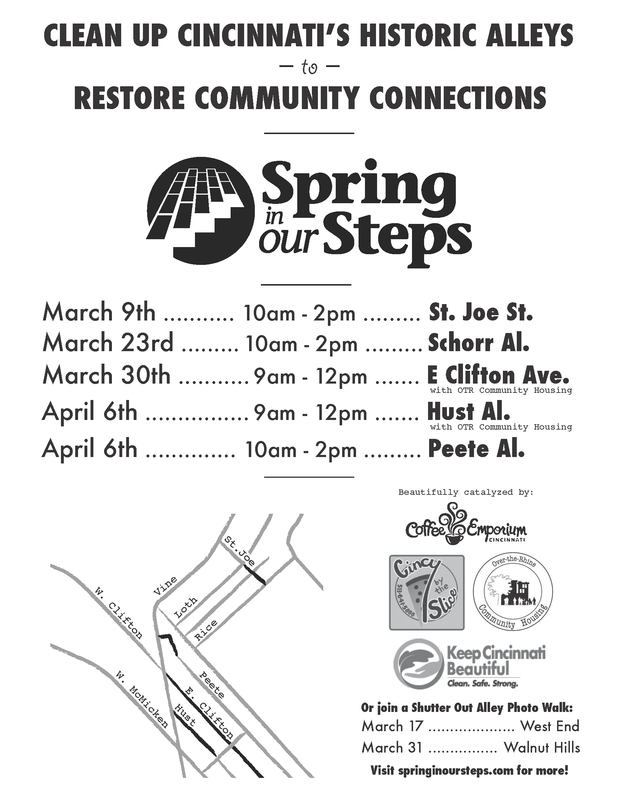 Spring in Our Steps is will hit the ground running in March, scheduling regular alley cleanups into April. Also remember to check our one of our alley photo walks, this month. We plan to photograph every alley in Cincinnati by year’s end. Finally, stay tuned for our second annual Stepping Up in April! stairway cleanup series, when we clean a stairway each day in April. Now, allow us to get some shut eye. Our first alley cleanup of the year is TODAY! We will make considerable progress at St. Joe Street and South Wendell Alley, with the help of Cincinnati Community Outreach and F&S Life and their Community Plunge service day. Sorry I missed this Linda. I was able to save it when Christian came to class. Thank you! This entry was posted on March 9, 2013 by C. Huelsman in Alleys.